A few days ago we had our first rain in a month. The mown fields scattered on either side of the road to our house begin to show signs of green again. The summertime ritual of haying has been over for a few weeks. I miss it. The sudden surprise of the smell of the cut hay. Then the spreading, the gathering into long rows, the baling. And if the bales are the older small rectangular ones, there is the wonderful spectacle of friends and family members and sometimes their dogs! all crowded together on the long, flat trailers, coming to help gather in the bales. This description is good enough. But it is just a description, an “aboutness” as American poet B. H. Fairchild says. These words do not create the “ issness” Fairchild says is the trademark of good poetry. Jack Gilbert in some notes taken at a workshop of his by American poet Susan Browne says it so well: Hopkins (Gerard Manley Hopkins) is not telling you about God, he is dancing you into an experience with God. Whenever I see a recently mown hayfield I think of the poem Twliight – After Haying, by American poet Jane Kenyon (1947-1995). This poem doesn’t tell me about haying – it gives me the experience. I am there. And to be honest it eclipses anything I might imagine writing about haying. And in that way the Rumi poem above says it all! This is a place I am not able to reach yet on my own. So Kenyon does it for me. What a deal! I have a soft spot for Kenyon because of her poetry, of course, but also because of her courage in facing so much sorrow and turmoil in her life. She suffered from deep bouts of depression, survived a cancer scare and then faced the possibility of the death of her husband, the poet Donald Hall, through his struggle with cancer. In spite of all of her setbacks and challenges she persevered with grit and hope. That comes through in her poems and in a celebrated interview with Bill Moyers in 1993 included in his book The Language of Life. In a terrible irony Moyers, in that interview, focused on her life-giving attitude to her husband’s cancer but it was Kenyon who was just months away from being diagnosed with previously undetected leukemia in January 1994. She died in April 1995. Her husband still lives today. Kenyon’s poem Twilight : After Haying is highlighted in an essay by Wendell Berry in his collection called Imagination in Place (Counterpoint 2010). In the essay Sweetness Preserved he gives Kenyon a lovely compliment: Sometimes I feel competitive or jealous when I suspect that somebody has written better than I can about something I know. When I am certain someone has done so, then I am relieved and I feel happy. “Twilight: After Haying” made me happy that day in 1986 [when he first heard it read by Kenyon], and it has made me happy every time I have read it since. This is a poem about haying and so much more. I am riveted by the unexpected connection she makes between the bales and the human body and shadows and the soul. And this is just for starters. A gutsy move coming as it does right at the beginning. The soul is a tricky word to use anywhere in a poem but because it is contrasted with concrete, so-called ordinary details it works. 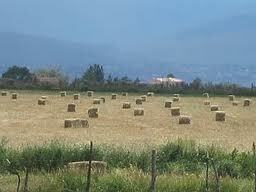 When I think of haying I think of harvest. Of completion. I don’t think right away of the attendant losses. Bliss and suffering tied together like the bales. But Kenyon takes me there. She builds the metaphor from the images that ground the poem – the men in the fields afterwards, the bird cries and sweet exhalations of timothy and vetch. In a general comment on Kenyon’s poetry Berry says something about her poems which applies so clearly in this poem: They are revelations of ordinary satisfactions, joys, sufferings, deliverances which, in being revealed, become somehow numinous and resonant – extraordinary. Kenyon’s faith and spiritual sensibility shine out of her poems but does so with a natural simplicity and grace. In so many ways this poem echoes hope in spite of endings and disruptions. The moon, itself such a symbol of rise and fall and renewal, counts the bales and at the poem’s end there is dew in stark contrast to the dusty stubble. The poem and its simple tone is true to the quotidian, the everyday. But somehow at the poem’s conclusion I am left with something mysterious and not so obvious – the idea of the soul and some seed of hope about its lasting nature. All this from watching hay being harvested! Kenyon’s faith shines out in her work. Yes. But she also she knows how to express her anger and frustrations. Here is one of the last poems she wrote. One, her husband says she would have kept editiong if she had lived. even the old and the relatively infirm. Berry also says this about Kenyon which I so appreciate: It is the perfection of tone that makes her poems able to accommodate sudden declarations of spiritual knowledge or religious faith, and that gives to so many of her poems the quality of prayer. I want to conclude with one of her best-known and beloved poems, Let Evening Come – that reads so much like a prayer or a psalm. Her whole-hearted acceptance in this poem of all that life throws at us is humbling and inspiring. It was featured in Moyers’ interview. Knowing, as I know now, how unknown and close her own “Evening” was at that time, the poem’s certainty of God’s comfort is even more haunting and poignant..
Comfortless, so let the evening come. The unswerving belief that underlies the last stanza of this poem brings me up short every time I read it. Part of me flinches, wonders, do I utterly accept this? But as Rumi reminds me when he says this is what his poems are all about, to reach what we cannot, I can allow Kenyon’s poem to take me where I can’t yet go on my own. I can allow it to take me to a place of acceptance and belief in spite of all evidence to the contrary. She gives me the courage, on this outstanding day of sun and summer fullness, to say to the light and shadows on the lawn, to the water in the bird bath, let evening come. This entry was written by Richard Osler, posted on August 9, 2013 at 1:14 pm, filed under General and tagged Donald Hall, Imagination in Place, Jane Kenyon, Jelaluddin Rumi, Let Evening Come, Otherwise - New and Selected Poems, Twilight: After Haying, Wendell Berry. Bookmark the permalink. Follow any comments here with the RSS feed for this post. Oh, oh, I have never seen nor done haying, but now I feel I have. Thank you for posting this poem, Richard, and for your observations on what Kenyon achieves here. Somehow, she slows down that interior sense of time and as Doty puts it, we are “brought into intimate proximity” with another’s experience of the world. I was looking for a poem about death, and the line “what else could it do” came into my head, but I couldn’t remember its source–and your post gave me a lot more than that. Now I will go to the meeting at my UU fellowship tonight with some real beauty to give them. Thank you! il like you poem and i wont to show you that i make my self like poem.